Choco is a small yellow bird with striped feet and puffy cheeks. He is sad, because he is alone in the world. He tries to find a mother that looks like him: a giraffe is yellow, but doesn't have wings. A walrus has puffy cheeks, but is not yellow. A bear does not have striped feet, puffy cheeks, and is not yellow, but is friendly, warm, loving, welcoming, and motherly. 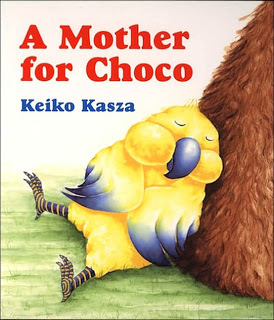 A Mother for Choco is a great book for families that adopt or foster cross-culturally, to help young kids realize that people don't have to look alike to be a family. You can buy it here or hear the story here! Don't forget to check out the Kids' Books section of this site for more recommended books!